For the pattern, go to my pattern pages and follow the links to Ravelry. If you need a plain text version, please let me know and I will send it to you. Enjoy! Copyright 2009 by Invisible Loom and Craft, all rights reserved. For personal use only. Two projects on the looms this Wednesday; a pretty shawl on the large afghan loom, made with Universal Wool in long stripes. The stripes are a soft green, blue, cream, yellow. The collar is a pretty mohair from Lily Chin in the same green. The second project is a shrug on the small afghan loom. Made from Cascade 220 Wool in blue tweed, it has an interesting ribbed pattern: k4/p4/k4/p4 etc for 3 rows, the 4th row is then knit. The pattern repeats, making a nice, soft rib design. The final rectangle is stitched at the sides to create a jacket. I have uploaded lots of project photos at Ravelry. I'm momcook if you want to visit. I made use of what I had and made two collages for Halloween: The bad witch and the good witch. Lots of modge podge glue, some vintage cards from the internet, scrapbook paper and tissue paper, and some glittery letters and rub ons from the dollar bins. Purple round KK (48 pegs) or Green round KK( 36 pegs) - any round loom with multiple of 6 pegs will work with pattern. For the pattern, go to my pattern pages and follow the links to Ravelry. Of you need a plain text version, please let me know and I will send it to you. Enjoy! Copyright 2009- 2011 by Invisible Loom and Craft, All Rights Reserved. For Personal Use Only. Listening to books while I loom knit has become very enjoyable. My husband's ipod is now mine, and I'm not giving it back :) Unabridged is my favorite source for books - they are free to the blind, and if you select the 7 day check out option, you can have 5 books a week. My guilty pleasure is the "Master and Commander" series, read by Simon Vance. I do not know why, but I enjoy these books very much. They take place two-hundred years ago, on a British Navel ship, and it is wonderful! I have been trading off with historical biographies and other history books, as well as lighter novels, including some of the knitting series. It is fun to listen to books about knitting while knitting. Today I finished the Brighten Circle Cowl, my version, and I am just adding a little ruffled edging now. It was a rainy day, and good for knitting. The original needle knit version is at Lion Brand Yarn, and you can see a photo of it there. Note - if you have another afghan loom with more pegs, it will still work, up to about 130 pegs, but you may need an extra skein of each yarn for the added size. Makes an adult size ladies cowl. 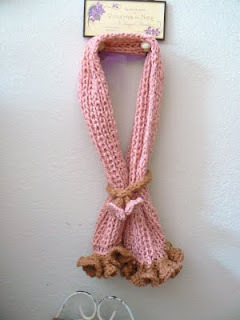 You will work with two strands of yarn as one, using 1 of each color. Another nice combination in this yarn is Spice and Macadamia. Continue working as a flat panel in e-wrap knit until the piece measures 2 1/2 half inches from the start. Join as a circle, and knit 4 rows in garter stitch. Knit in e-wrap knit until the cowl is 16 inches long. Crochet cast-off, chaining 1 between each loop as you cast-off. If desired, single crochet around the edges, and then add another row of crochet for a little ruffled edge. I did mine in the Strawberry, because pink is a color I can see a little of. The top of the cowl is the flat panel, and it is meant to fold over. The cowl is is soft and will roll and curl around your neck and shoulders. The "wrong" side is folded over on the top, showing off the contrasting stitches and the two colors in a pretty way. Pattern for private use only. Since my illness, my cats have been my constant companions. They clearly know I am blind, and one of them stays with me if I am not feeling well, which is quite often these days. They even trade off duty - one will go to sit in the back yard, and one will be with me until the other comes back. I have loom knit a kitty in the likeness of each, an orange tabby and a black tabby, to add to our fall decorations. I took out all of my Halloween books, even though I cannot read them this year. It still seemed important to have them out, along with the decorations. I have two projects on my looms right now. A lovely lilac scarf for Teen Girl, with a bit of plum mohair at the ends. It is chunky, but soft, done in a double moss stitch. She picked the style from one of the Twinkle knit books, which have very stylish girls wearing chunky knits and looking cool. As her un-cool mom, I was happy she asked me for something :) I am making it with a yarn called Rowan Soft Tweed in thistle, and it is such a pleasure to work with. I love Smileys Yarn! The second project is the Brighton Cowl, in two strands of nature's cotton from Lion. It is a little hard on the hands, so I work it a bit, then switch to something else, like a little kitty or pumpkin. But this one will be for me, with strawberry pink and pecan colors, so I am looking forward to it. Lion Brand Yarn is an example of how easy it is to make a site accessible to everyone. They have an options for font size, brailler input, pdf pattern downloads, and view without pictures - and all for free. They have nearly 3000 free knitting and crocheting patterns. I love this site! And I've let them know how much. I wish all sites were like Lion. I've made many of the patterns. They have quite a few that are for loom knitting, and many that can be easily converted. I'm working on the Brighten Cowl right now in Lions' Natures Organic Cotton. It is soft and cuddly, but with double strands it is also warm. No itching, because it is so soft. My husband is overwhelmed with taking over "mom" duties, and has not gotten out the 3 large bins of Halloween decorations we usually put out on October 1st. So, I have taken the hints from the Loom Class group at Yahoo , Loom-a-Long group on Ravelry, and Markman Loom group at Yahoo, and have loomed our decorations. From Loom Class, a darling black cat; from Loom-a-long, several patterns have been offered for pumpkins; and from Lynn Markman, an apple and apple basket pattern. I went on from there to make tea cozies in the pumpkin and apple themes. If only I had more orange yarn!!! I also ran out of fiber fill, but, I find that stash yarn (the ones I know I will never use) makes a good filling for little creations. Hope to add photos soon - still waiting for my replacement camera card reader. But you can find some of the pumpkins at the groups listed, and also at this blog: madebytelaine.blogspot.com/ She has a lovely blog to visit. What a great discovery! There are 2 crochet and 1 knitting magazine available as digital downloads in pdf. What that means is that you can download the magazine to your computer, and use the enlargement and - even better for low vision - the read out loud - built into pdf. Adobe reader software is free, and works very well. In fact, I have an easier time with pdf files than when I use the special reader installed by the accessibility tech. The magazines are also reasonable - $15.00 for 3 years. You get 2 years of the archives, plus the next years' issues. I've been having a ball going through all the past issues. The three are : Creative Knitting, Crochet! and Crochet World. I have to say, I love magazines of any kind, and I wish more were available this way. It is such fun to "read" them again, and blow up the pictures, and have the patterns read aloud. Hope you might enjoy these, too. My other big news is that four of my patterns have been published in loom knitter circle magazine: The Go Team Hat for him or her; Ruffled Scarf; Origami Purse; and Baby Cozy. The photos are at the top of this post. 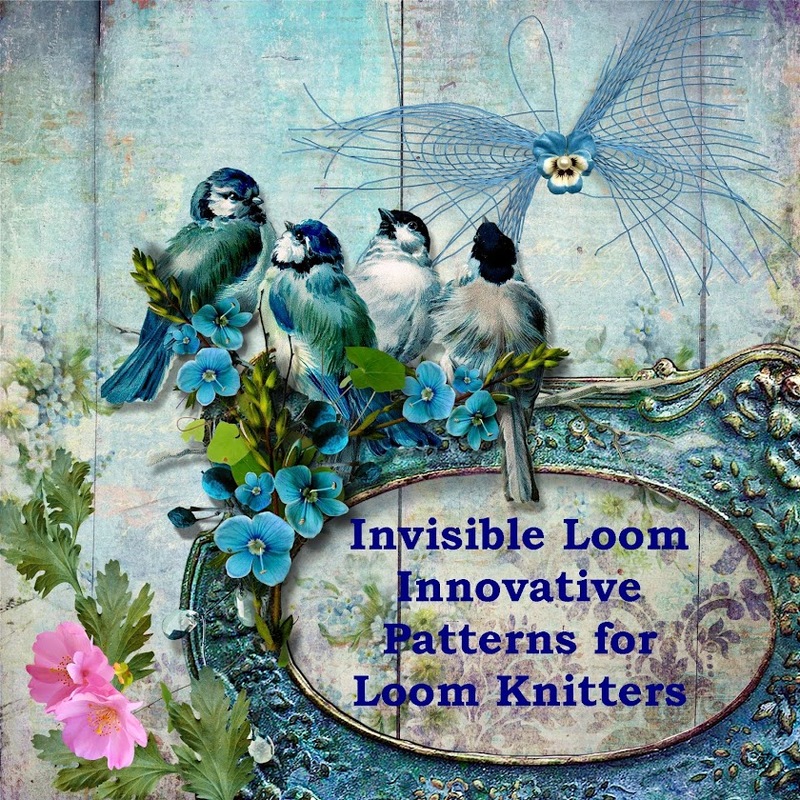 You can get all the patterns free at the site (see my links) or you can get the magazine as a pdf download (which has the "read out loud" option for visually impaired, as will as built in magnification) and they are adding 2 more patterns as a bonus later in the year. The patterns in the magazine are really cute - the clown on the cover is darling, and there are some beautiful designs all around. I'm pretty excited. Hope to be back soom - I have tons of patterns written, and lots to share.